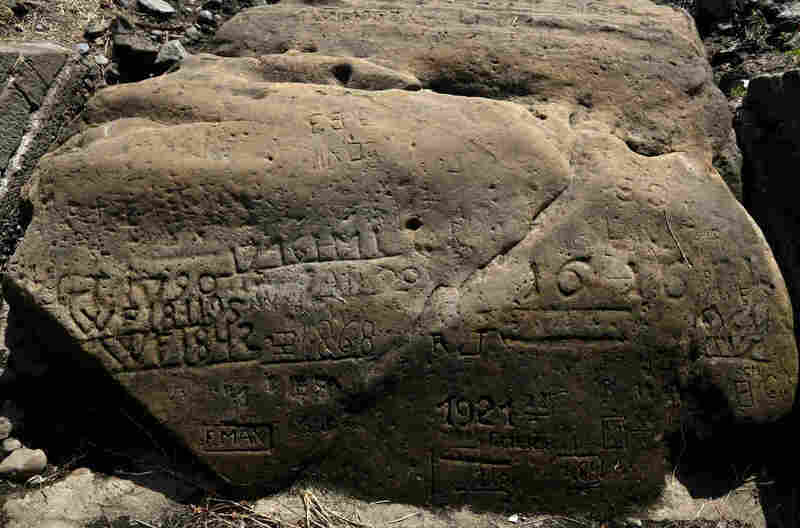 Drought In Central Europe Reveals Cautionary 'Hunger Stones' In Czech River For hundreds of years, these boulders have warned about the consequence of devastating droughts — and documented them for posterity. One says "if you see me, weep." A "hunger stone" exposed by the low level of water in the Elbe River is seen in Decin, Czech Republic, on Thursday. The low level of water caused by the recent drought has exposed the stones on the riverbed. One of the stones on the banks of the Elbe is carved with the words "Wenn du mich siehst, dann weine": "If you see me, weep." A team of Czech researchers described that stone in detail in a 2013 paper about the history of droughts in Czech lands. "It expressed that drought had brought a bad harvest, lack of food, high prices and hunger for poor people. Before 1900, the following droughts are commemorated on the stone: 1417, 1616, 1707, 1746, 1790, 1800, 1811, 1830, 1842, 1868, 1892, and 1893." That particular stone is now a bit of a tourist attraction; it's one of the oldest hydrological landmarks in central Europe. Also, because of a dam on a tributary of the Elbe, it's seen more often now than it used to be, according to a Decin tourist site — although the current river levels are still exceptional. 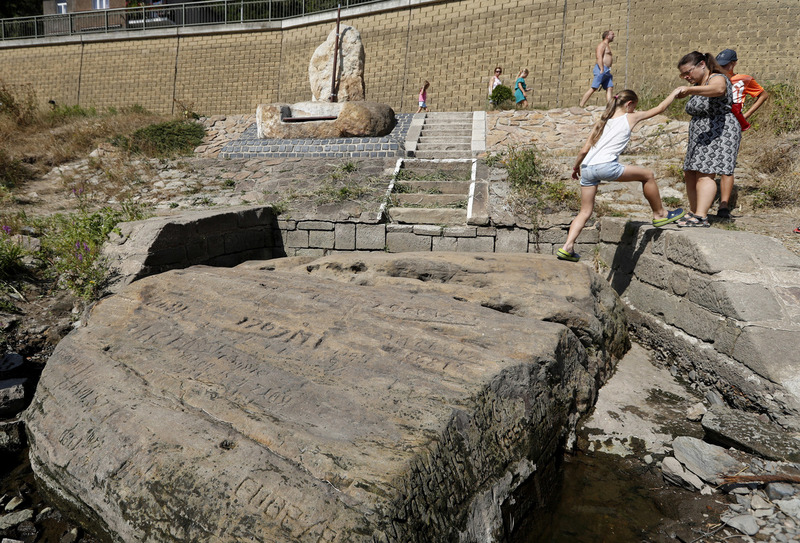 People visit a famous "hunger stone" exposed by the low level of water in the Elbe river in Decin, Czech Republic, on Thursday. The Elbe is the place where American and Soviet troops famously met in April 1945 as they advanced from opposite directions on Nazi Germany during World War II. The dropping water levels on the river have also exposed munitions from that conflict, Deutsche Welle reported earlier this month. And the levels on the Danube in Hungary have reached record lows in three sections, causing headaches for cruise ships and freighters, Reuters reports. Europe has suffered repeated intense droughts in the past few years. Of course, as the record on the hunger stone indicates, this region of Europe has seen plenty of of devastating droughts before. Tree-ring research in north-central Europe has found evidence of repeated "megadroughts" in the 15th through 19th centuries. And an article in Nature earlier this summer compared recent droughts in Europe to droughts over the last 250 years. The scientists found that the 21st century droughts were indeed extreme, but not as long-lasting or as massive as the worst of the historic ones. However, the same study noted that the more recent droughts are also linked to record-breaking temperatures. That appears to be causing "unprecedented drying trends" for the soil, which hurts crops. This trend "raises concerns about the consequences of extreme meteorological droughts" as the climate continues to warm, the researchers note. The drought in northern and central Europe this year is "one of the most intense regional droughts in recent memory," The Guardian wrote in July, and it is paired with abnormally hot temperatures.